There are times when I wonder if I have become immune to the deaths, violence and suffering of Aboriginal people. And then, often quite unexpectedly, something lifts me up to a new place of insight and range of emotions. I find my immunity, or perhaps it is my resistance, cannot last for very long. 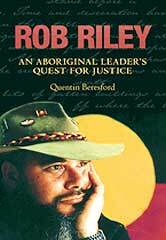 This describes something of my experience when reading this compelling book about Aboriginal leader and activist, Rob Riley. I first met Rob in 1989 when he was working for the Royal Commission into Aboriginal Deaths in Custody (RCIADIC). He was responsible for the Western Australian Issues Unit that came under Commissioner Pat Dodson’s brief to examine underlying issues. Since that time I have always valued his offer to take me into the world which I knew so little about, the place where he grew up, Sister Kate’s Children’s Home in Perth. As the RCIADIC moved around us and its demands grew increasingly intense, he would find time to close his office door and share with me something of his early life. Sister Kate’s was the home where he was taken as a baby and where many other Aboriginal children were also taken. It was his ‘home’ for the first eleven years of his life. Whether he felt that I would or needed to understand his story, because I had lived in Aboriginal communities and knew something of their dormitory stories, or whether he felt the need to work through the issues that were emerging as a result of the RCIADIC, I still am not sure. However, I sensed then, as Quentin Beresford reveals, Rob’s ambivalence about his ‘home’. It was a place of growing up and making lasting friends. It was also a place that deeply wounded him. Rob’s life was certainly not dull or boring. The book captures well that particular slice of Australian history where Aboriginal leaders emerged in the 1970s and 80s with great energy and purpose. As a field officer for the Aboriginal Legal Service, then a leader of the protests at Noonkanbah and as Chair of the National Aboriginal Conference, Rob both led and acted in his own distinctive, direct style. His ability to address and focus on an issue was impressive. He was articulate and often fiercely outspoken. He was also wounded, as if early life experiences would not let him go. Drugs, mental illness and loneliness each played their part. His active, committed but flawed human life offered little evidence at that time that he would die some seven years after the Commission, by his own hand, aged 41. Nor was it expected that in the year after his death there would be the Bringing Them Home report. This was the first, public recognition of Aboriginal children who like himself, were forcibly separated from their families and ‘grown up’ in institutions such as Sister Kate’s. Now it is May 2007, ten years after that report was first tabled in our Federal Parliament. In the years that followed, voices within our Federal Government have sought to challenge a number of its claims, but the film Rabbit Proof Fence, and many other human stories, have revealed more about those faces and the deeply buried emotions experienced by those of the ‘stolen generations’. Whatever the numbers, the rationalisations and the excuses, what can no longer be denied is the hurt and pain felt by many who have lived through the consequences of those race-based policies. Recently, I came across the song, 'Accolades', by the Australian band The Standard Deviations. It was composed by Vicki Bennett who, as a medical practitioner, first met Rob in Roebourne (WA), probably around the same time as I did in 1989. Her life was changed as a result of that encounter. Her song is a reminder of Rob’s journey, the pain that he and many others share due to separation from family. It sings of the journey ahead, of reconciliation and justice. It is also a remembrance of a talented and committed Aboriginal leader, who died before his gifts and contributions could be publicly acknowledged. why do we leave praising ‘til somebody’s dead. This book is another accolade of sorts. It celebrates Rob’s efforts to redress the litany of wrongs and injustices towards his people. 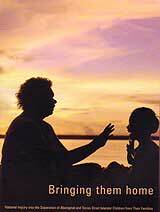 At the same time, it reveals the tragedy within his story as it also touches a raw wound in our Australian psyche. It is hard not to be touched by the energy and humanness of his life, the great moments of insight, humour and activity. It is equally hard not be touched by his suffering and those deeply tragic moments of despair. Rob would be pleased that I continue to remember him and the stories of his early life. There are times when I cannot remain immune and forget. I am looking forward to read this book.There is an enourmous need of new leaders:what happened in the past is a tragedy that is mandatory to aknowledge. But now is time to work for the future. What breaks my heart is the fact that so little is being achieved in terms of cooperation between the Aboriginal and non Aboriginal communities in rural Australia. I spend part of my time in the Macquarie Valley and visit Dubbo very often. Paradoxically, it was thirty years ago an area that could have been used as the example of a successful integration and cooperation of communities. When teaching in a Catholic primary school in the early 1980's I established one of the first programs to teach Aboriginal culture with the participation of local elders that was a grat success. Now the picture has changed dramatically. There is strife even among the original local Aboriginal community and the ones who were brought to live there from metropolitan areas. These new residents don't have any rural skills, don't have jobs and live at the margins of society. Why does history have to repeat itself? Only the intervention of leaders who can show the way can re-establish what has been lost. Can you help me on where to purchase the song "accolades" by the band the standard deviations please. Thank you,Brian, for a very clear and penetrationg review. Like Dina, it certainly makes me keen to read the book. Just this afternoon, I also read your article,"Don't Go", quite different, but encouraging and uplifting. Thanks again! Deliver Us From Evil, which details atrocious acts of abuse committed by former Catholic priest Oliver O'Grady. The eyewitness testimony is compelling, although nasty allegations are levelled against O'Grady and allowed to stand without substantiation. Traffic chaos suggests a reason Italians are so good at opera. Life in their cities unfolds each day not with the rational continuity of the novel, or the spareness of the short story, but with traditional opera’s volatility and impatience with the mundane.